Flash head rotates horizontally 180o to the left and right. Repeating flash for creating stroboscopic multiple-exposure effect. Individual flash mode settings ([TTL], [AA], [A] and [M]) are available for each of the four groups (including master controller) for easy total lighting control based on the brightness of the subject and not simply on general output ratios for each group. The SB-900 provides improved AF assisting accuracy by being able to cover all 51 AF points with the D3, D700, and D300 (as of 7/2008), and with wider coverage from 20-105mm. 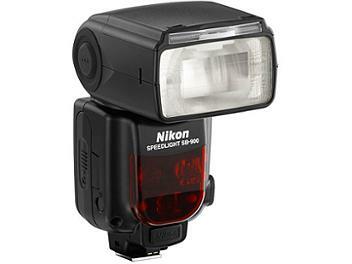 Allows uploading of performance enhancement developments to the SB-900 with select Nikon digital SLR cameras.